Pinkeye Defined. When the white of the eye becomes pink or red, it's called pinkeye. Conjunctivitis is the medical name for pinkeye. The conjunctiva is the membrane that covers the white of the eye. It becomes pink or red when it is infected or irritated. Pinkeye (conjunctivitis) has many causes. 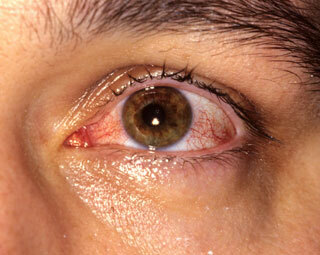 Viral Conjunctivitis is the main cause of pink or red eyes without pus. Most often, it is part of a cold. Bacterial Conjunctivitis. Pinkeye plus the eyelids are stuck together with pus. Most likely, this is a secondary infection of a viral conjunctivitis. Allergic Conjunctivitis from pollens. Most children with eye allergies also have nasal allergies (hay fever). Symptoms include sneezing and clear nasal discharge. Irritant Conjunctivitis from sunscreen, soap, chlorine in pool water, smoke, or smog. Irritants can also be transferred by touching the eye with dirty fingers. Irritants can be food or plant resins. Contact Lens Conjunctivitis is caused by poor use of disinfectant solution or lenses kept in overnight. Rebound Conjunctivitis from Vasoconstrictor Eye Drop Abuse. Usually occurs in teens who use daily OTC eye drops to remove mild redness. After the medicine wears off, the blood vessels become larger than they were to begin with. Similar to the rebound nasal congestion seen in chronic nose drop abuse. Foreign Object. If only one side has pinkeye, an object in the eye must be considered. Palpebral Cellulitis (Serious). A bacterial infection of the eyelids and skin around them. Causes the lids to be very red and swollen. Some viruses cause watery eyes (viral conjunctivitis). It may be the first symptom of a cold. It isn't serious. You can treat this at home. Colds can cause a small amount of mucus in the corner of the eye. Cleanse eyelids with warm water and a clean cotton ball. Try to do this 3 times a day. This usually will keep a bacterial infection from occurring. Artificial tears often make red eyes feel better. No prescription is needed. They can be used at any age. Use 1 drop per eye 3 times a day as needed. Use them after cleansing the eyelids. Antibiotic and vasoconstrictor eye drops do not help viral eye infections. Pinkeye with watery discharge is harmless. There is a slight risk it could be passed to others. Children with pink eyes from a cold do not need to miss any school. Pinkeye is not a public health risk. Keeping these children home is over-reacting. If asked, tell the school your child is on eye drops (artificial tears). Pinkeye with a cold usually lasts about 7 days. Pinkeye from an irritant usually goes away within 2 hours after it's removed. Most eye irritants cause redness of the eyes. It that will go away on its own. You can treat that at home. Wash the face with mild soap and water. This will remove any irritants still on the face. Rinse the eyelids with warm water for 5 minutes. Red eyes from irritants usually feel much better after being washed out. At any age, if eyes remain bloodshot, you can use some artificial tears. Dose: 1 drop, 3 times per day, as needed. If more than 6 years old, switch to a vasoconstrictor eye drop (such as Visine). No prescription is needed. Dose: Use 1 drop. May repeat once in 8 to 12 hours. Never use for more than 3 days. After the irritant is removed, the eyes usually return to normal color. This may take 1 to 2 hours. Try to avoid future contact with the irritant.